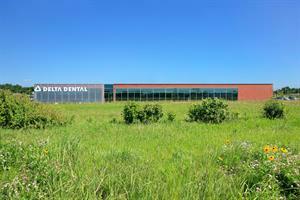 A national non-profit dental insurance provider relocated its corporate headquarters to a new office building on a highly-visible site along a major interstate. Company leadership selected this site with the intention that the building itself would become an economic branding and promotional device – architecture as advertisement – aimed directly at the millions of motorists who travel this stretch of interstate each week. The exterior of the building is clad in a terra cotta rainscreen system; selected for its modularity, speed of installation, and visual warmth of the material. 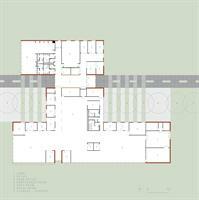 The terra cotta panel size sets up an organizational grid that is carried through the entire building. The dimensions became a driving force behind the proportions and rhythms utilized throughout the building, including the twelve foot wide by fourteen foot tall window module. 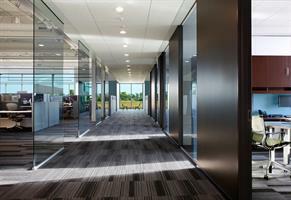 This module is repeated around the entire building, and depending on the function of the space behind the window module, the glazing alternates between vision and spandrel glass.